There comes a time when enough is enough. Trying to debate with a liberal isn’t an easy task. In response, they often respond with such vitriol that all attempts at reason fall upon deaf ears. Now, we have Maxine Waters calling for the public to Harass Trump officials is a dangerous precedent to make. “Crazy” Maxine needs to understand that she is a public figure making speeches to her followers, which is then broadcast to millions of people on television. These videos calling for Civil Unrest and potentially violence against Trump Voters and Staff are shared and go global through social media. To encourage Civil Unrest, harassment, is stirring the political pot that can quickly escalate into violence. Since we have witnessed Maxine Waters encourage civil unrest to Trump supporters we have already seen an increase in threats. Public safety is now a concern more than it has ever been during the Trump presidency. One example that has already came to light, is that the Department of Homeland Security has warned it’s employees that there is a “heightened threat against DHS employees.” There has been a drastic increase in threats made against DHS employees all the way from the top to low level staff members. Come be a “Rinoswamper” on Facebook With Us! Claire Grady, acting deputy secretary of Homeland Security, had good reason to make this statement in a letter. DHS has reported that one official who resides in Washington D.C. found a burnt and decapitated animal on his porch. This violent extreme (and criminal) behavior is likely in direct response to Maxine Water’s calling for civil unrest and protests against public figures who support Donald Trump. 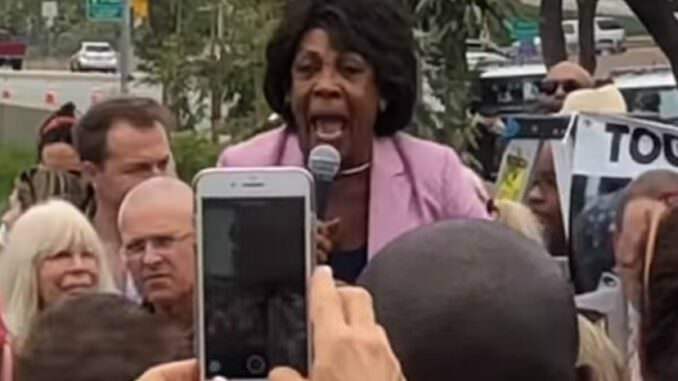 Maxine Waters called for her follower physically engage Trump supporters via public protests and harassment to Trump officials at their homes, and wherever they venture (restaurants) in public. Just recently Kirstjen Nielsen (Homeland Security Secretary) was publicly harassed and ran out of a D.C. Mexian restaurant in a scary situation. One of the “protesters” also just happened to be an Department of Justice employee. In addition to Secretary Nielsen’s public harrasment, Trump Secretary Sarah Huckabee was also refused service. It’s not only officials directly tied to Donald Trump that are being harrassed. Florida Attorney General Pam Bondi could not even enjoy a movie (a Mister Rogers documentary) without being harassed outside the theater. The rise in public hostility, aggressive protesting tactics has resulted in a public health scare. When you have decapitated and burned animals on your porch, you have to accept that the vitriol not only met “Civil Unrest” criteria it has surpassed it. Furthermore, the escalating violence has reached a point where the justice system needs to take control. Maxine Waters, while trying to deflect any ownership back to Trump is directly responsible for this rise in violent protests. We live in a society where we have the right to assemble peacefully, whether it be in a restaurant, movie theater or Donald Trump rally. Maxine Waters has encouraged public unrest and needs to be held accountable for the retaliatory response that her followers have carried out. These are no longer threats, they have been public displays of criminal behavior. As a conservative “Pro-Trump” blogger, it is difficult to find a footing in media climate that discriminates against any viewpoints that stray from their Anti-Trump agenda. Please Like “Rinoswamp” on Facebook or join us on Twitter. We love our president and our country. Please support us and help grow our Conservative Pro-Trump online community.